NEW YORK, USA -- Wladimir Klitschko, the heavyweight champion of the world, was trying to rescue a news conference that was supposed to be promoting a title bout at Madison Square Garden. Klitschko with Banks, right, and his brother, Vitali, second from right, during a fight against Francesco Pianeta. Klitschko has had 17 successful heavyweight championship defenses. Save for a few camera clicks, the room was quiet when he stepped to the microphone. “Guys, you are lame,” Klitschko said, smiling. The line drew a few laughs. Klitschko stretched out his arms and greeted New York the way that he would have liked to be welcomed. Over the next eight minutes, he spoke about his love of New York and the significance of fighting at the Garden. Klitschko, who holds a doctorate in sports science from the University of Kiev, could have been across town at the United Nations delivering an impassioned plea for his native Ukraine. In Europe, Klitschko fights fill soccer stadiums. But he has trouble selling out the Garden despite a 63-3 record with 54 knockouts, including 17 successful heavyweight championship defenses, the third highest career total. Klitschko’s lack of popularity here is not entirely his fault. There has been a dearth of American heavyweight contenders — neither Eddie Chambers nor Tony Thompson, the champion’s only opponents from the United States since 2009, is a household name. Then there is Klitschko’s style, which can at times make fencing look more combative. At 6 feet 6 inches tall, Klitschko breaks down his opponents in the early rounds with his staggering reach. He can pop a powerful jab, but, according to Bryant Jennings, Klitschko’s opponent on Saturday, he prefers to tie his opponents up, transforming his matches into waltzes. “He holds very well,” said Jennings, who is 19-0. Klitschko’s trainer, Johnathon Banks, doubts his fighter will ever be recognized as the world’s best pound-for-pound boxer. “The thing that bothers me the most is that the American public will not appreciate what he has done until he’s long retired,” Banks said. The champ’s historical standing is not a priority for him right now. In December, Klitschko’s and his fiancée, the actress Hayden Panettierre, had their first child, a daughter, Kaya Evdokia. Then there is the continuing crisis in his home country. According to the United Nations, more than 6,100 people have been killed in Ukraine conflict during the past year. Klitschko’s brother, Vitali – himself a former heavyweight champion – is on the front lines as the mayor of Kiev, the nation’s capital city. Klitschko said that this trip to New York was, in part, a diplomatic mission. “I’m not a politician,” Klitschko said. Right now, that means turning the focus to his homeland. 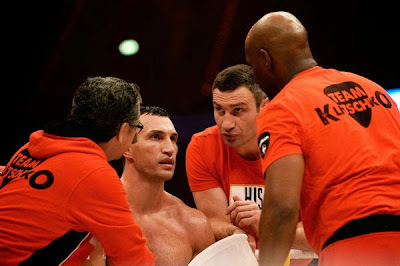 “There’s a lot of desperation,” Klitschko said. Along the wall of the Lucky Street Boxing Gym in Hollywood, Fla., the phrase “Blood, Sweat, No Fear” is painted in large, black letters. On a recent Tuesday afternoon, several high-grade fans suspended from the ceiling offered little comfort to those gathered for Klitschko’s daily public training session. Klitschko loves to be around people, and prefers the background noise of a crowd to the quiet of an empty gym. As Klitschko waited for his workout to begin, his trainer, Banks, stood off to the side. “He’s not the type of guy to lose focus,” Banks said. In 2004, Banks became Klitschko’s chief sparring partner. He came on board after Klitschko’s third loss, a fifth-round technical knockout at the hands of an American, Lamon Brewster. “He was at the bottom,” Banks said of Klitschko. Instead, Klitschko and Banks got to work under the Hall of Fame trainer Emanuel Steward. Four fights later, Klitschko won the International Boxing Federation championship. When Steward died of colon cancer in 2012, Banks became Klitschko’s trainer. Their dynamic is unusual: Banks, 32, is younger than his pupil, and an accomplished fighter. He owns a record of 29-3-1 and, in 2012, Banks ascended to No. 2 in the World Boxing Organization’s heavyweight rankings. Though Banks still fights occasionally, he switched his focus to training Kitschko. “I’m basically the No. 1 contender, but I’m training the guy,” he said. Adjacent to the Lucky Street’s gym area is a large, well-appointed den. Apart from a collection of Muhammad Ali photos that line one of the walls, this place offers very few hints about what goes on next door. Klitschko, who is fluent in four languages, was being interviewed by a German magazine reporter. Later, he switched to English, and spoke about the crisis at home. “A year and a half ago, millions of Ukrainians, and I’m sure Russians as well would’ve said: ‘A war against our brother folk? This is impossible. This is insane,’” he said. Klitschko returned to Kiev in late February, and was shaken up witnessing firsthand the horrors of war. “You should see the eyes of people when they say, ‘I lost, with one explosion, everything,’ ” he said. Klitschko speaks daily with his brother about the stress he is under as the mayor of Kiev. In a widely reported episode earlier this year, Vitali Klitschko was sprayed with a fire extinguisher while trying to calm down a protest in Kiev’s Independence Square. “It’s a tough job,” Wladimir said. Klitschko has little desire to join his brother in politics. But Klitschko embraces his status as a statesman of sorts, and has spoken out frequently concerning his homeland. “This is an issue that’s not just a Ukraine issue,” Kltschko said. Klitschko is confident that there will be peace in the region eventually. He just hopes that it comes before more lives are lost. “I know that the day will come where Russia will say, ‘How can we do that to our own brother folk Ukraine?’ ” he said. Each morning at 7:30 comes the sound of Klitschko honing the craft that allows him to offer his world views to a wide audience. “I’m not focused when I’m not in the gym,” Klitschko said. With 10 knockouts among his 19 victories, Klitschko’s 30-year-old opponent, Jennings, of Philadelphia, is considered by most to be a credible opponent, with at least a chance to pull off the upset. A potential matchup that truly piques the interest of fight fans, though, is one between Klitschko and Deontay Wilder of Tuscaloosa, Ala.
Wilder, 29, is 33-0 with 32 knockouts and holds the World Boxing Council’s championship belt. Klitschko wants to face Wilder and perhaps achieve that signature victory that many believe is missing from his résumé. “Am I on the peak of the mountain with my performance?” he asks. Inside the ring, Banks called out punch combinations, three or four shots at a time. The gym was quiet. Klitschko and Banks were in their own world, their shoes squeaking on the canvas in an almost-perfect cadence. Klitschko threw a right cross that connected flush with Banks’s mitt. The champ paused for a moment to admire his shot. “That was a vicious punch,” Klitschko said, smiling. “I agree,” Banks said. The punch was hard to miss. And that is what Klitschko wants more than anything — for people simply to notice.